Drop in CPI confirms Social Security beneficiaries will see no benefit increase, again, while upper-income recipients will see big jump in Part B premiums. The release Thursday of the Consumer Price Index figures for September 2015 confirmed that all Social Security beneficiaries — old age and survivors, disabled workers and SSI recipients — will not see a COLA increase in benefits next year for the third time since 2009. Under law, that will also mean that Social Security beneficiaries with higher incomes will see increases in their premiums for Medicare Part B, which pays for physicians’ bills, outpatient care, durable medical devices and other goods and services. 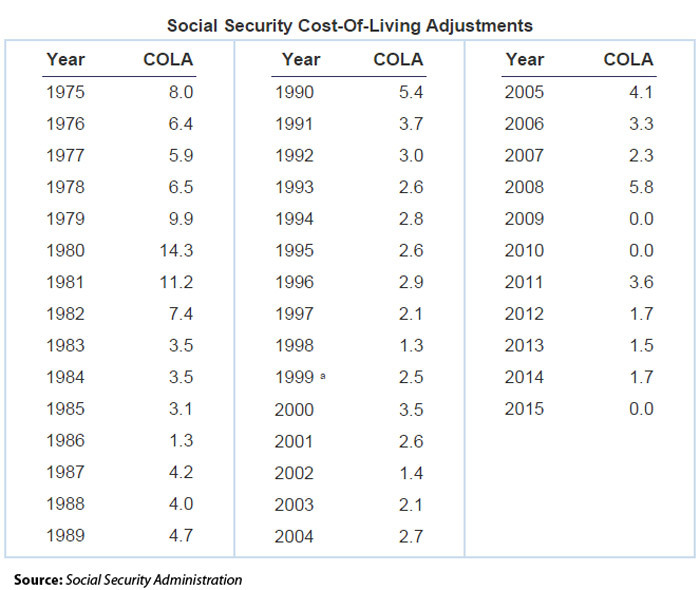 In the chart below, are Social Security COLAs since 1975; they are announced in Q4 for the following year with changes seen in checks beginning in January. 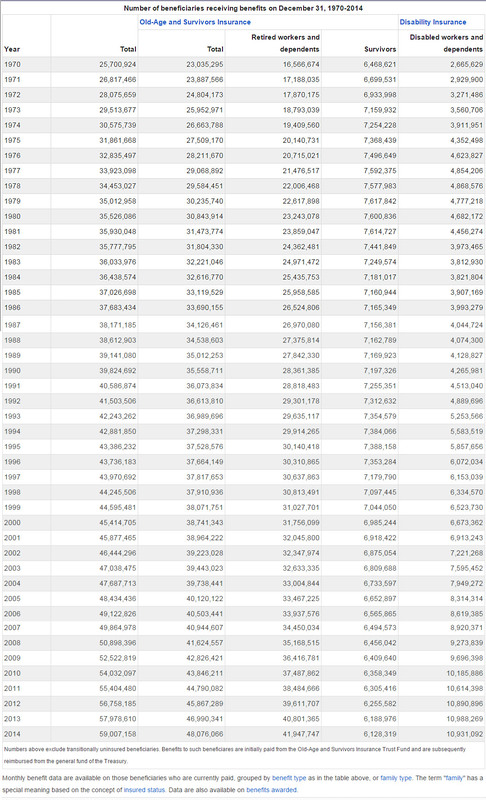 You can see the double-digit increase in Social Security benefits in 1980-81 when inflation was spiraling upward. The Bureau of Labor Statistics reported Thursday morning that the Consumer Price Index for Urban Wage Earners and Clerical Workers, or CPI-W, the inflation index on which Social Security COLAs are based, declined 0.6% from September 2014 and 0.3% in September. The SSA also released a fact sheet summarizing the changes in Social Security for 2016. Pressure is increasing for action in Washington, in the words of an AARP letter to all members of Congress, “to pass a fix for Medicare beneficiaries who face much higher cost increases” because of the lack of a COLA next year. The “held-harmless” phrase refers to the income thresholds that determine premiums for Part B of Medicare. In a paper from Boston College’s Center for Retirement Research (CRR), Alicia Munnell and Anqi Chen wrote earlier this year that by law, the cost of higher Medicare Part B premiums cannot be passed on to most beneficiaries — about 70% of whom are considered “held harmless” on premiums — when they do not get a raise in their overall Social Security benefits. The remaining 30% of beneficiaries thus must make up for the higher costs of the Medicare system by paying higher premiums based on their income. Ironically, Oct. 15 is the beginning of the Medicare Open Enrollment period when Medicare members can choose their Medicare Advantage of Prescription Drug Plan for next year; the open enrollment period ends Dec. 7. William Byrnes, associate dean for special projects at the Texas A&M University School of Law, characterizes the lack of a COLA and the increase in Part B premiums more bluntly. “It’s the Federal government’s way of mitigating expenditures on the backs of seniors” who have contributed to the Social Security system for decades. Moreover, Byrnes says that the measure of inflation is flawed, particularly for older people, and uses his own mother as an example. “She’s 86, so she doesn’t drive any more,” so she doesn’t directly benefit from the decline in gasoline prices. Instead, the cost of her taxi rides to the supermarket has increased, and once she does buy her groceries, “it’s not like the cost of an orange has gone down,” even though in theory lower energy prices means lower transportation costs to deliver that orange to the supermarket should result in lower prices. According to the Social Security Administration, as of year-end 2014 there were 59 million total Social Security beneficiaries, There were only 31 million total recipients in 1975, when the first automatic COLA was applied following passage by Congress of the 1972 Social Security Amendments as a rider–in another irony–to a debt-extension bill. Who Faces Higher Premiums Next Year? Finally, speaking of inflation, below is inflation measured by CPI-W over the past ten years, through September 2015.